Ever since we discovered the pokébowl it has been on! You can imagine the happiness when we discovered that this delicious dish comes from the Hawaiian Islands!! But recently I took a intolerance test and discovered that I am not only lactose intolerant, but also intolerant for wheat, corn, beets, egg yolk and some other stuff. So there was no other option then to design my version of the pokébowl. 1. make rice of your choice as stated on the package. 2. cut the salmon into smaller pieces. 3. cut the radis into smaller pieces. 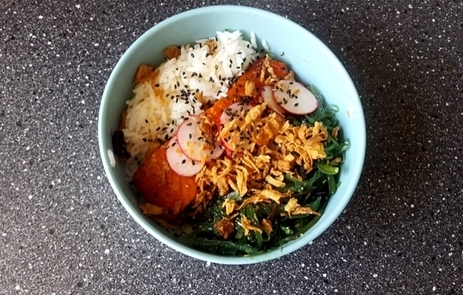 3. fill your bowl with the rice and sprinkle some rice vinegar on top. 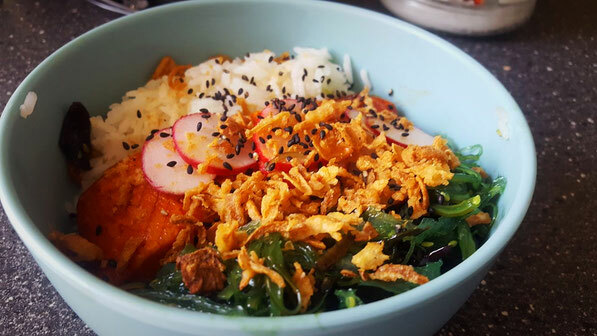 4. top the bowl with the salmon, radis, seaweed, fried onions and black sesame seeds. 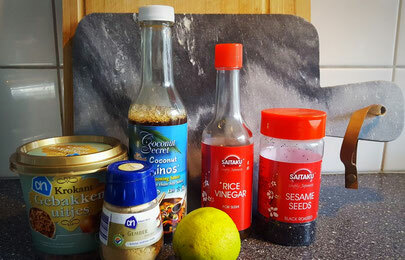 5. add some coconut aminos as replacement of soy sauce. 6. add some juice of the lime and a little bit of ginger powder. 7. devour the pokébowl nom nom nom. Did you make the recipe? How was it? Leave a comment below!